The Disenchantments of "La La Land"
These categories, some of which overlap, are: the movie’s masculinism; its view of jazz; the way jazz intersects with race; the movie’s conspicuously individualist view of art-making and success; Chazelle’s directorial personality; and the movie’s nostalgia. Not all movies are equally stimulating for critics to write about – either for or against – but La La Land has ignited a remarkable number and range of responses. I'd like to enlist writings by ten or so fellow critics here, and weave their voices into this post. I will forego all narrative exposition, and assume that readers have seen the film. [Sebastian] is the author of their relationship: he comes to ask her out at work; he introduces her to jazz; he takes her to see Rebel Without a Cause for research (despite the fact that she is the actor and supposed cinephile); he suggests that she write something herself since she can’t get a part, prompting her to write a one-woman play and quit her job … later, when Mia’s play has failed and she has retreated home to Nevada, it is Sebastian who gets the call from a casting agency about a major audition, and drives out to find her and implores her to give acting one last go … the movie is not hers. It is Sebastian’s. [Chazelle] is particularly attached to scenes in which men teach women how to play musical instruments, explain music to them, or play music for them: [in Guy and Madeleine on a Park Bench] Guy (Jason Palmer) teaches his mother to play the piano and Madeline (Desiree Garcia) gets a lesson from a male drummer; Guy plays for both his girlfriend Madeline and Elena (Sandha Khin), the girl that he leaves her for; later, Madeline dates another older musician. Andrew [in Whiplash] rattles off information about the music playing in the pizza to his girlfriend, Nicole (Melissa Benoist). Sebastian, of course, plays for Mia and teaches her to appreciate jazz. Music, then, effectively serves as both an emotional conduit and a subtle affirmation of power: where Fletcher [in Whiplash] uses his status as Andrew’s teacher as a cudgel to assert his dominance, Guy and Sebastian — and, indeed, Andrew — maintain their status as the more worldly, dominant partner in a subtler way, through the assertion of their artistic skill and cultural knowledge. With the exception of Mia, the women on the receiving end of this treatment are directionless and therefore ideal counterparts: Madeline’s field in graduate school is never specified, Nicole doesn’t even know her major, and all we know about Elena is that she is so incompetent that she has to have a man show her how to boil water. Early on, after a few chance run-ins lead to a burgeoning flirtation, Mia makes a damning confession: She doesn’t like jazz. This is a big mistake. Only tell a Male Music Nerd that you do not like their preferred music if you have at least four free hours on your schedule to be taught exactly why you’re wrong. Seb responds by dragging Mia to a jazz club in the middle of the day. “It’s conflict and compromise,” explains Seb, talking loudly over the live band that they came to see. “It’s new every time … and it’s dying.” … Mia is ultimately convinced, seemingly not by the music itself (which Seb keeps talking over) but by the passion and enthusiasm with which he presents it to her. “People love what people are passionate about,” she concedes. Andrew isn’t in a band or a combo, doesn’t get together with his fellow-students and jam … He doesn’t study music theory, not alone and not … with his peers. There’s no obsessive comparing of recordings and styles, no sense of a wide-ranging appreciation of jazz history … In short, the musician’s life is about pure competitive ambition—the concert band and the exposure it provides—and nothing else. Mia … tries to make a name for herself by writing, self-financing, and performing a one-woman show—and her biggest audition involves her solo performance of a monologue of her own making, for a starring role in a movie that has no script and will, a casting agent says, be “built around” her. Sebastian wants to open a jazz club and wants to play jazz (“pure jazz,” he says), but his pianistic ideal, and the setting in which he shines, is solo. The couple of times we see Sebastian play with others – in Keith’s (John Legend’s) band or the ‘80s pop cover group – it is clearly signaled by the film that the music is somehow beneath him, and he is “selling out”. Mia writes and produces and stages her one-woman show at a theatre, but Chazelle has no interest in the vitality and conflict and fascinating details of that process—there’s nothing about her working with others on it, whether a stage director or a lighting technician. Nothing about the making of sets, nothing about rehearsing, nothing about the concrete details of the business. When Mia visits her family in Boulder City, there’s no family life whatsoever on view. Chazelle is interested in Mia not as a character or as a person but as an ornament, a symbol of a kind of dream and a kind of success. Ever since the movie musical’s decline as a popular form, there have been periodic attempts to revive it. Some of these have been artistically successful, others have been Les Misérables (2012), but almost all have conceded to the fact that they don’t make them like they used to because you can’t make them like they used to, and that the musical needs to exploit new forms, new technologies, and new subject matter in order to reach a new public. In this La La Land is an exception—it doesn’t want to bridge the last sixty-odd years so much as pretend they never happened, to return to an imagined Eden of old-fashioned razzle-dazzle and audience innocence. Chazelle is smart and knows exactly what he’s doing here – and so we get the scene in which Keith (John Legend) asks Sebastian, “How are you gonna be a revolutionary if you’re such a traditionalist? You’re holding on to the past but jazz is about the future.” But this gesture from Chazelle is pure disingenuousness. He simply tosses in the question – thus pretending to significance – but the film does absolutely nothing to pursue it or play it out. If Keith’s band is one of the “futures” of jazz – as the movie clearly seems to imply – we are unambiguously asked to view contemporary jazz as watered-down and inferior to the classic jazz that Jeb fetishizes. And so it is with movies too. La La Land looks back at a small, select history of cinema – 1950s Hollywood musicals like Singin’ in the Rain, Jacques Demy, Rebel Without A Cause – and raids them for its inspirations. Justin Hurwitz’s songs – their melodies, harmonies, and arrangements – lean too heavily on Michel Legrand, and (for me) struggle to distinguish themselves. They sound blandly pleasant, but evaporated from my ears the moment the end credits rolled. The songs are trite when they aren't outright unmemorable, and Seb's piano theme just seemed like sad random tinkling. 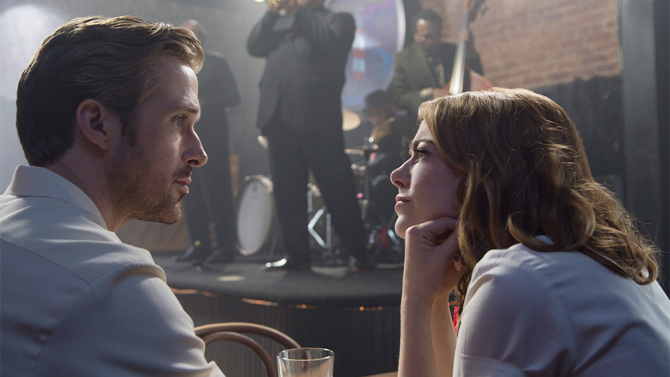 This is a problem, given that Sebastian (Ryan Gosling) has no real personality apart from his love of jazz. There's an awkward pull here between the actual quality on display and the almost art-frat aggression with which the viewer is relentlessly pummeled with the whole Romanticist, never-give-up-on-your-dreams business. The fact that John Legend is positioned as the sellout option here (to say nothing of "I Ran," one of the greatest 80s synth-pop hits this side of Gary Numan) just adds to the sense that something about this world is way out of whack. Why have the introductory highway hoedown just unfold in one take, when you can also include Matrix-style camera swivels to capture bicycle pirouettes in mid-air? [The film is] designed to not so much seduce audiences as pummel them into submission. Swoon, goddamnit, swoon! [Sebastian/Gosling] eventually opens up his own jazz club that’s wildly successful and gains him a black apprentice who’s pretty good on the piano himself, but not too good, otherwise he’d own Gosling’s club himself! The nightclub audience laughs at this joke, but in the film audience, it lands with a thud, because you know what? If you’re gonna make a film about an artist staying true to the roots of jazz against the odds and against modern reinventions of the genre (from white musicians like, say, Mayer Hawthorne), you'd think that artist would be black […] Positioning Ryan Gosling as jazz’s white savior while relegating black musicians to the background left a sour taste in my mouth. In La La Land, African-American musicians are rendered (as in Whiplash) as measuring sticks for an ascendant white performer’s monomaniacal notions of “purity,” while African-American actors are either used as benign props—as when Sebastian encounters a sweet (and totally mute) old couple while singing to himself at the end of a pier—or else as signifiers of authenticity (Gosling’s exuberant club-land buddies) or a lack thereof (John Legend’s smoothie sell-out, who may not be the villain of the piece but doesn’t make much sense as a character anyway). La La Land deserves its nominations and more: it deserves to win Best Picture. Because it isn’t escapism, it’s a story for our age. Ryan Gosling, who pluckily spent three months learning piano to play the protagonist, is the perfect hero in a year when the new president of the United States can take over with no training. His reality-show-standard song and dance routines are perfectly suited to this new era, when a mediocre businessman and second-rate television celebrity can become Commander-in-Chief. If Trump’s Education Secretary can’t write grammatically or answer questions on basic policy, how can we criticise an actor for less-than-perfect performances? Our current culture doesn’t just excuse amateurs, it elevates them to the highest roles.